Last week, I wrote about how pleased I was with my upgrade from Yosemite to El Capitan. I am still pleased, but daily use of El Capitan is starting to reveal things that I hadn’t noticed in my first few days of playing with the new OS. As I noted in my post, I am a fast user. Yosemite was very frustrating because of all kinds of small responsiveness issues that caused it to experience “hiccups” and to fail to register some of my keystrokes or mouse clicks if I went “too fast” for it. El Capitan’s responsiveness is much better. However, it’s not perfect. And I have a very simple example of a very common situation where, like its immediate predecessor, it fails miserably. 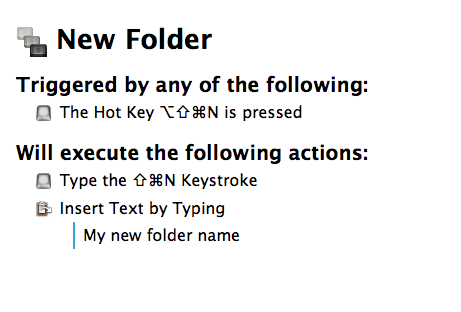 In OS X’s Finder, when I want to create a new folder, I tend to use the keyboard shortcut, i.e. command-shift-N. This is supposed to create the new folder and then make its default name (“untitled folder”) editable and highlighted, so that I can start typing the new name over the default name right away. The key problem here is what “right away” actually means. In my mind, it means what it means in everyday English, i.e. without any delay. In OS X 10.11, however, it means something else. It means “very soon after pressing command-shift-N, provided you give OS X a little time to recover from the tremendous strain of having to create a new folder and make its name editable and highlighted”. In practical terms, it means that, after I press command-shift-N on my machine (a 2014 Mac Pro with 32 GB of RAM, with a 1 TB SSD as the startup volume), I cannot start typing the name right away. I have to wait for a fraction of a second before I do so. If I don’t, then the first couple of letters I type fail to appear in the folder name that I typed. Yes, you read this right: I, Pierre Igot, am a supernaturally fast typist, with whom a powerful machine such as the 2014 Mac Pro is not able to keep up. I am joking, of course. There’s nothing supernatural about my typing, and I am quite sure the Mac Pro itself is not at fault. The problem is, as usual, with Apple’s software and, in this particular case, with El Capitan’s Finder. This macro does exact the same thing I do when I create a folder and type its name (“My new folder name” in this example), except, of course, that the macro is executed by the Keyboard Maestro engine, which is much faster than I, lowly human, can ever hope to be. And guess what? El Capitan’s Finder completely fails to record the entire typed text. When I execute this macro on my Mac Pro, all I get is a new folder titled “untitled folder”. There’s no sign of the typed text (“My new folder name”) that the macro has input as typed text. With that pause, everything works fine. If I only put a pause of 0.2 second, I get a folder with the truncated name “older name”. And if I only put a pause of 0.1 second, I get… nothing. 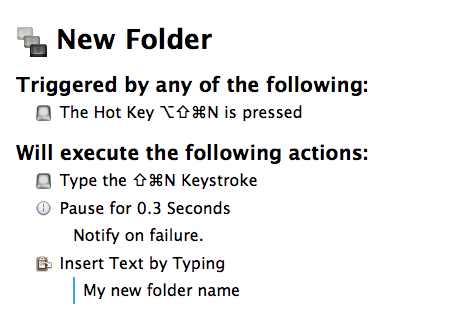 Of course, my own human hands are totally incapable of typing this fast, and in reality, when I execute these steps manually in El Capitan’s Finder, the worst that happens to me is that I am missing the very first letter of the name that I typed. But it happens often enough that it is very frustrating, especially since I only notice it once I’ve typed the rest of the name, and so I have to backtrack and edit the name manually in order to restore the missing letter at the beginning of the folder name. What is really unbelievable to me here is not so much that the Finder needs a fraction of a second after creating the folder. It is that there does not seem to be any kind of text input buffer that keeps my keystrokes in memory until the OS is ready to process them. The keystroke(s) that the Finder fails to register simply disappear into the ether, as if the characters had never been typed. How on earth is this acceptable in a modern operating system? It’s one thing to have speed/responsiveness issues. It’s quite another to fail to include standard features such as a keyboard buffer in order to minimize the impact of such issues on the actual usability of the software. Last week, I was tempted to call El Capitan the best OS X release in a long time. It still is way better than Yosemite, and probably also better than Mavericks, Mountain Lion, and Lion. But beyond that? I don’t remember having basic keyboard buffer issues in the old days of OS X. What the hell is going at Apple? In the rush to add new features and simplify computing for the masses, have they somehow completely forgotten the basics? Two words, Apple: Keyboard. Buffer. PS: If you are as bothered by this as I am, please report (rdar://25375085). UPDATE: BR closed by Apple as duplicate of BR #23108215 on 2016-04-12. This entry was posted by Pierre Igot on Saturday, March 26th, 2016 at 2:33 pm	and is filed under Macintosh. You can follow any responses to this entry through the RSS 2.0 feed. Responses are currently closed, but you can trackback from your own site.